Your family and friends will enjoy these fun, festive vanilla and peppermint-flavored holiday sugar cookies. For Cookies: Position oven rack in the center of oven and preheat to 350°F (175°C). Line two large, heavy light-colored baking sheets with parchment paper; set aside. In a medium bowl, whisk flour, baking powder and salt until blended; set aside. In a large mixing bowl, add butter, sugar, cream, vanilla and peppermint extracts; beat with a hand-held mixer on medium speed until fluffy, which should take about two minutes. Scrape the sides of the bowl as needed. Reduce speed to medium-low; add eggs one at a time and beat after each addition. Using a rubber spatula, fold in the dry ingredients one half at a time. Divide dough into two even pieces, then press each piece into a disk shape. Wrap them tightly with plastic wrap and refrigerate for one hour. Dough should be cool and firm but easy to work with. In a small bowl, whisk powdered sugar and flour until blended; set aside. Working with one piece of dough at a time, place on a clean, dusted surface. Roll dough to about 1/8-inch thickness. Use cookie cutters to cut shapes and transfer with a thin offset metal spatula to prepared cookie sheets. For even baking, do not overcrowd cookies. Gather remaining dough, cover with plastic and chill. Continue with second chilled dough. For best results, bake one sheet pan at a time until done, which should take about 10 minutes; remove and place cookies on wire racks to cool. Decorate and store in an airtight container. For Peppermint Glaze and Peppermint Piping Icing: In a small bowl, whisk together powdered sugar and meringue powder. Add water and peppermint extract, stir until smooth. Glaze cookies in desired colors and set aside to dry before piping. For the piping icing, remake the glaze recipe and add additional confectioners' sugar, one tablespoon at a time until desired consistency is reached. Divide icing into small bowls; add desired gel colors. 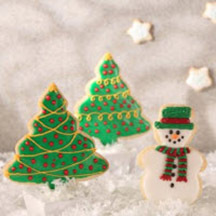 Select pastry tips, prepare pastry bags and creatively pipe icing onto glazed cookies. Recipe and photograph provided by Nielsen-Massey via Brandpoint Content; Copyright 1996-2014.